When MM was about twelve months old, she was given a box of crayons, a stack of paper and a colouring book. She loved them. Every day, she spent a good long chunk of time scribbling - wild, carefree masses of colour; rainbow squiggles all over a sheet of A3; a solitary knot of red covering the outlines of ten different flowers. As she got older, she learnt to control the crayons better. Sometimes, she draws lots of straight lines because she can; sometimes she draws lots of circles because she can; sometimes she draws zigzags because she can. When she colours in, each part of the picture will be smothered in a different colour. And, left to her own devices, her crayon control will improve even further. She will learn how to join her shapes into recognisable pictures. She will begin colouring within the lines. She will start asking herself "What colour would this strawberry normally be?" instead of "Which crayon haven't I used yet?" (although I do hope that, eventually, she will come full circle and start purposely breaking the rules). But, recently, when other people are crayoning with her, I've noticed them asking, "What are you drawing? Is it Daddy? Is it a cat? Shall we draw a dinosaur?" More and more, she's shoving the crayons aside and saying, "I can't do it." She has started realising that, technically, she's not very good at drawing and colouring in right now - she doesn't have the skills to create the end result they've suggested. She doesn't realise that, developmentally, she's exactly where she's supposed to be. She is becoming discouraged; she doesn't hear me when I stress, "You can't do it YET, but soon you will learn." I am a big believer in allowing kids to enjoy the process rather than encouraging them to focus on an end result. This doesn't mean never encouraging MM to enjoy the process of painting on thick paper, then cutting the results into Christmas tree shapes and sticking them onto cards - I'm quite happy to have my own sneaky toddler art projects, as long as they don't cause stress to my kid. And it doesn't mean never allowing her to stick masses of tiny bits of tissue paper on to transparent sticky-back plastic then turning it around and saying, "Look! You made a suncatcher!" Sometimes it's nice to surprise her with what she's managed to do. But, over the past couple of years, I've left her to scribble with crayons and watched with pride as the squiggles slowly became more intentional. I've left her to swirl her hands through goopy paint (although not as much as I'd like because, ugh, the clean up!) and watched with joy as she started purposefully selecting colours for herself. 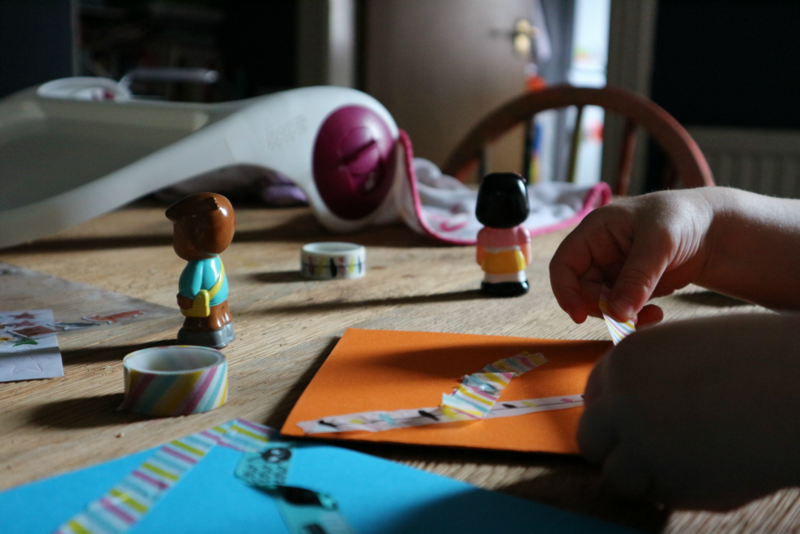 I've left her to plonk stickers wherever she liked on a sheet of paper and watched with awe as she naturally began giving the paper a top and a bottom, turning all the stickers to face the same direction. And I'm thrilled that's she's now starting to make things - cards for other people; flags for herself; space rockets out of cardboard boxes - that she's now starting to realise that art can be used to create something wonderful. My Pinterest is full of ideas and inspiration for her and I do hope that, eventually, she'll start asking to see those pins and/or will start leafing through books to find projects of her own. I'm eagerly anticipating the days when she can have and follow an idea from start to finish, even if that might mean our house being covered in wonky, splodgy egg cartons with yoghurt pots on top. But, right now, I'm waiting. I'm letting her figure it out in her own time. Because I hope art will be something she comes to naturally, something with brings her joy and pride; it would break my heart if creating things became a parent-pleasing chore.